I had a look in the WRLog.log and saw that the bulk of the activity is centered around the repeatedly changing EXE files in my working folders (every time I compile a new EXE, more activity). The perfect solution to this problem would be to allow me to specify my working folder tree to be off-limits to WSA scans; I never install 3rd party software into my working folder tree and some days I recompile my apps dozens of times. Is there a way to specify an off-limits folder? I think I see what I need to do; I'm going to write a clean-up app to automate this process. Delete all dbNNNN.db files in deletion list. ...and WebRoot came back up without any errors. I need to put a few finishing touches on the util (along with a short write-up); if anybody is intereseted, I'll put it up for download in a day or so. It didn't handle a network file path correctly (i.e. "\WIN8BOXShareScadaPhoneInstall.exe"); When the exclude list contained a network path, my app would not delete anything; when I removed the \WIN8BOX items from the list of excluded folders, it worked. 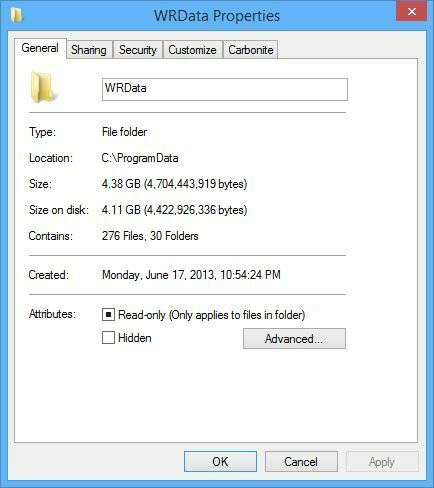 After running this on my Windows 7 test computer and finishing a long sequence of db file recycling, my app coughed-up an "out of memory" error and subsequently saved the WRLog.log as a file of zero bytes (oops). I made backups when I ran it on my primary machine (no probs there), but I did not make backups on my Win7 test machine... So now I have no historic WRLog.log file data from which I can make the EXE to NNNN association (without being able to decode the db file). P.S. After accidentally wiping out the WRLog.log file on my Win7 machine; WSA did not display any errors when it was restarted and the file is once again being populated with information.